TE1801 Look as gorgeous coming as going at this Prom 2018 in this sleeveless ballgown that splashes sparkle tulle over satin. 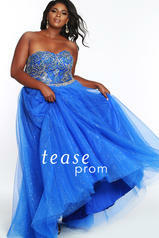 This floor length silhouette design has a sweetheart, strapless neckline with gold embroidered bodice with sequins. The gown is fully lined, and finished off with a horsehair hemline. You'll like how the natural waist line flatters your body. Available in black, red or royal blue. This gown's center-back zipper makes it easy to get in and out of, although you won't be eager to take it off after you get so many compliments!